The Tyrant has control of the artefact known as the Fáil, and as he strengthena his hold on the forces of dark magic, he now threatens Earth as well as Tír. 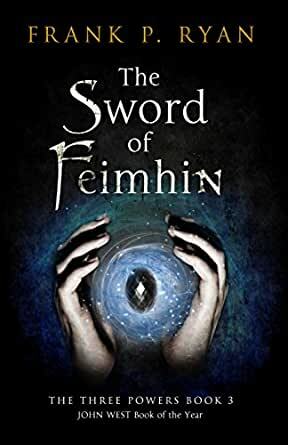 In a violently dystopian London, Mark has joined forced with Nantosueta to search for the Sword of Feimhin, while on Tír, Alan has mustered a Shee army and is intent taking the fight to the Tyrant - but obstacles obstruct his path at every turn. And Kate, now in the in-between world of Dromenon, finds herself entering the Land of the Dead . . .
Day by day and hour by hour, the looming threat grows. 5.0 out of 5 starsAn Epic Adventure! "The Sword Of Feinhin" is an intoxicating story that opens after the Great Witch has been destroyed in the Tower of Bones and the Tyrant of the Wastelands is planning to unleash his evil on an unsuspecting London. In a unique blend of the dystopian and the magic of fantasy Frank P. Ryan weaves together multiple strands of a plot that is captivating from the first page to the last. As the story opens Mark and Nantosueta , searching for Pradraig O'Brien the druidic guardian of a powerful sword join the Resistance to thwart the menace of the Razzmatazzers and the Skulls, as well as the ruthless evil of the religious fanatic Silas Grimstone. In the struggle they stumble into an artistic but emotionally- troubled teen Penny Postlethwaite who's searching for her destiny as she creates a map of a divided city-one above and one below. In the parallel land of Tir Alan Duval and his Shee army on a forced march to wage war on the Tyrant's capital city of Ghork Mea are plagued with obstacles which threaten their mission while his girlfriend Kate Shaunessy has pledged the power of her oraculum to heal the dying Momu and the Cill people as the Tree of Life begins to wither. Reminiscent of J.R.R. Tolkien and C.S. Lewis Frank P. Ryan has created an epic fantasy that spans two lands; one filled with magic and non-human beings at war with the dark evil of a tyrant, and a dystopian London plagued by anarchy, fires and dwindling power sources, its populace faced with hopelessness and despair. Even within these two worlds the author taps other dimensions like the Land of the Dead where Kate spiritually explores the leviathan roots of the Tree of Life in her hunt for the serpent-dragon Nidhoggr whose freedom could unleash chaos. In London Penny Postlethwaite discovers "the City Below" created by slug-like weavers, the Akkharu with its dark foreboding, and a sinister character that promises her an ominous destiny. With vivid imagery the author builds emotional intensity and suspense drawing the reader into the complexity of troubles in both worlds ; one very real and the other almost dream-like. With every chapter the reader is introduced to a bevy of real and imaginative creatures who add to the drama, power and fervour of the story. Of the four friends from Earth Mark Grimstone the abused, adopted son of Silas Grimstone is brave, resourceful and fearless. He shares the Third Power of death with his girlfriend Nantosueta, Queen of Monisle on Tir, a bold and valiant warrior. Kate Shaunessy holds the Second Power in the oraculum on her brow, that of healing and birth. She can be naive but is also very caring, patient and empathetic. Her boyfriend Alan Duval, another of the earth friends wields the first power, that of the land. A respected leader he's intense, driven, and goal -oriented. In London Penny Postlethwaite the troubled teen who's aloof, logical and impulsive doesn't like to be touched even by her flatmate Gully Doughty a streetwise, restless but overly cautious friend. Among imaginative creatures on Tir is Prince Lyezz one of the winged Eyrie people who's steadfast and trustworthy; Bétaald, the dignified and intelligent spiritual advisor of the cat people and Magtakk the Mischievous, a survivor of the magician's race who's a robust and level-headed orang-utan. These characters and more add to a story that vibrates with an adventure that boggles the mind with its magnitude and complexity. I thoroughly enjoyed "The Sword Of Feinhin", and recommend it highly to those that like a dystopian- fantasy mix that climaxes in a cliff-hanger that begs for another book.